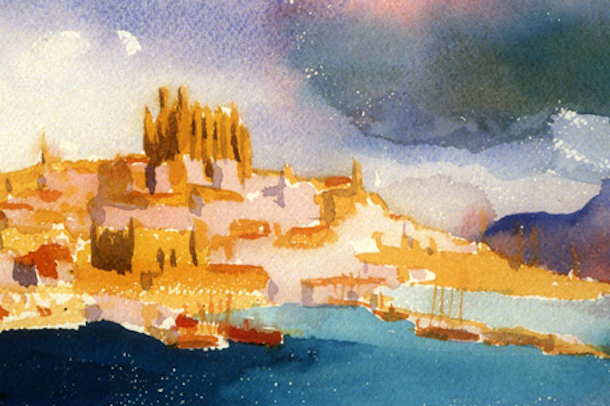 Palma de Majorca, c. 1920, watercolor by John Dos Passos. In October 1916, a few months after graduating from Harvard, John Dos Passos traveled to Spain, ostensibly because the trip would help prepare him for a possible career in architecture. He spent the first couple of months in Madrid and visited several towns in the surrounding countryside. Shortly after Christmas he made a trip that included stops in Cartagena, Tarragona, and Alicante. His wanderings sparked a fascination with a country he would often visit and feature in his writing. “Spain was the most important factor among many in shaping Dos Passos’s ideas and forming the way he saw the world,” writes biographer Townsend Ludington. During this first stay in Spain, Dos Passos received news of his father’s death and he returned to the United States in February 1917, only to discover that his family’s estate was mired in debt. In April the United States entered the war in Europe and the twenty-one-year-old joined other Harvard graduates as members of the Norton-Harjes Ambulance Corps, a volunteer organization run by the American Red Cross. At the Verdun front in August, he endured German shelling and poison gas—an experience that increased his disenchantment with modernity. “The war is utter damn nonsense,” he wrote to a friend from the front, “a vast cancer fed by lies and self seeking malignity on the part of those who don’t do the fighting.” His criticisms in one intercepted letter—and his unruly behavior—provoked Red Cross authorities to accuse him of disloyalty, so he returned to the United States in August 1918 and enlisted in the U.S. Army Medical Corps. His unit set sail for Europe on November 12—and then found out that the war had ended the day before their departure. 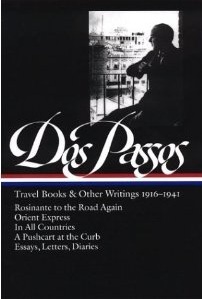 Dos Passos returned to Spain in August 1919 and stayed for eight months. Over the next two years he published a series of essays on Spanish society and culture in various literary and political magazines. George Doran, who had already agreed to publish Dos Passos’s first novel, Three Soldiers, also accepted his proposal for a collection of writings about Spain. Dos Passos rearranged and heavily revised the various magazine pieces into the sixteen chapters of Rosinante to the Road Again—Rocinante being the name of Don Quixote’s horse. Half of the book relates the journey from Madrid to Toledo by two young travelers, whose Quixote-inspired adventures are interspersed with eight stand-alone essays providing a kaleidoscopic and impressionistic portrait of contemporary Spanish culture, literature, and politics. Notes: The Mermaid (mentioned on page 16) was a London tavern frequented in the early seventeenth century by Shakespeare, Sir Walter Raleigh, Ben Jonson, Francis Beaumont, John Fletcher, and John Donne. Most of the Spanish phrases and passages in the story will be clear from context, or from explication later in the selection, or from Dos Passos’s parenthetical translations. For convenience, we’ve listed a number of items below, in the order of appearance. Qué burro la Guerra – How stupid war is. En América no se divierte – In America they don’t have fun. Ca, en América no se hase na’a que trabahar y de’cansar – Sure, in America they don’t do anything but work and then sleep so they can work again. The song on page 15 – What did King Don Juan do? / The princes of Aragon / What did they do? / What did they do with such gallantry, / What did they do with such invention, / How did they bring it? ¡Qué incultura! ¡Qué pueblo indecente! – How uncultured, how indecent. The path zigzagged down through the olive trees between thin chortling glitter of irrigation ditches that occasionally widened into green pools, reed-fringed, froggy, about which bristled scrub oleanders. . . . If you don't see the full selection below, click here (PDF) or click here (Google Docs) to read it—free!